We have all seen or heard about movies or read books that deal with unidentified flying objects or extra-terrestrials. From Close Encounters of the Third Kind and Star Trek to Communion and Intruders, the thought of alien life forms tantalizes the curious. People have had a fascination with the mystery of life on other planets for quite some time. When Orson Wells' War of the Worlds was broadcast, terror seemed to grip the population. Today, people are not as easily persuaded into believing stories of ghost and Martian invasions. However, the fact remains that many people do believe in extra-terrestrials. Even some scientists acknowledge the fact that someday we could come into contact with beings in another part of this incedibly vast universe. Yet, some people today believe that humans are presently being observed, and even abducted, by aliens. 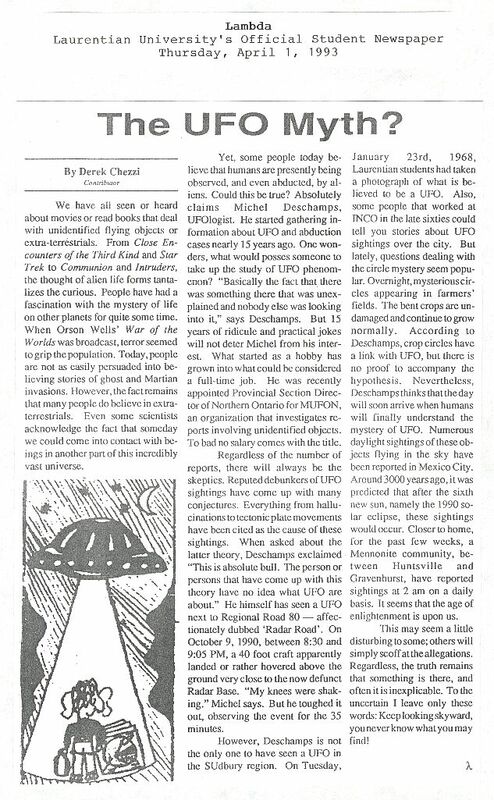 Michel Deschamps, UFOlogist. He started gathering information about UFO and abduction cases nearly 15 years ago. One wonders, what would possess someone to take up the study of UFO phenomenon? "Basically the fact that there was something there that was unexplained and nobody else was looking into it," says Deschamps. But 15 years of ridicule and practical jokes will not deter Michel from his interest. What started as a hobby has grown into what could be considered a full-time job. He was recently appointed Provincial Section Director of Northern Ontario for MUFON, an organization that investigates reports involving unidentified objects. Too bad no salary comes with the title. Ragardless of the number of reports, there will always be the skeptics. Reputed debunkers of UFO sightings have come up with many conjectures. Everything from hallucinations to tectonic plate movements have been cited as the cause of these sightings. When asked about the latter theory, Deschamps exclaimed "This is absolute bull. The person or persons that have come up with this theory have no idea what UFO are about." He himself has seen a UFO next to Regional Road 80 - affectionately dubbed 'Radar Road'. On October 9, 1990, between 8:30 and 9:05 PM, a 40-foot craft apparently landed or rather hovered above the ground very close to the now defunct Radar Base. "My knees were shaking," Michel says. But he toughed it out, observing the event for the 35 minutes. However, Deschamps is not the only one to have seen a UFO in the Sudbury region. On Tuesday, January 23rd, 1968, Laurentian students had taken a photograph of what is believed to be a UFO. Also, some people that worked at INCO in the late sixties could tell you stories about UFO sightings over the city. But lately, questions dealing with the circle mystery seem popular. Overnight, mysterious circles appearing in farmers' fields. The bent crops are undamaged and continue to grow normally. According to Deschamps, crop circles have a link with UFOs, but there is no proof to accompany the hypothesis. Nevertheless, Deschamps thinks that the day will soon arrive when humans will finally understand the mystery of UFO. Numerous daylight sightings of these objects flying in the sky have been reported in Mexico City. Around 3,000 years ago, it was predicted that after the sixth new sun, namely the 1990 solar eclipse, these sightings would occur. Closer to home, for the past few weeks, a Mennonite community, between Huntsville and Gravenhurst, have reported sightings at 2 am on a daily basis. It seems that the age of enlightenment is upon us. This may seem a little disturbing to some; others will simply scoff at the allegations. Regardless, the truth remains that something is there, and often it is inexplicable. To the uncertain I leave only these words: Keep looking skyward, you never know what you may find!